BadgeBox offers a possibility to assign different work locations for each employee. This means that an administrator can create different work locations, if needed, and that an employee confirms his presence at a specific location via GPS system while clocking-in. This is a possibility that can be enabled but also disabled in case not needed. However, it can be quite useful for managing attendance data in cases in which employees are changing different locations while working. It is important to say that BadgeBox does not follow an user and its geo-location but only records ones GPS location upon clock-in/out or when using track mode. This occurs only in case in which a GPS on a device is enabled. If a GPS on a device is disabled it is not possible to register user's location. A location can be created for section “Employees” where it is possible to create a location for a certain employee and from section “Company” where it is possible to add work locations and assign them to employees. To create a location it is necessary to enter required information such as title, city and address. In order to have a higher accuracy of clocking location it is possible to apply a range within which clock-in/out have to be done. As we can see in the example in the picture, the range applied in this case is 20 meters. This means than a user has to be within 20 meter from the address defined as a location when clocking work time. 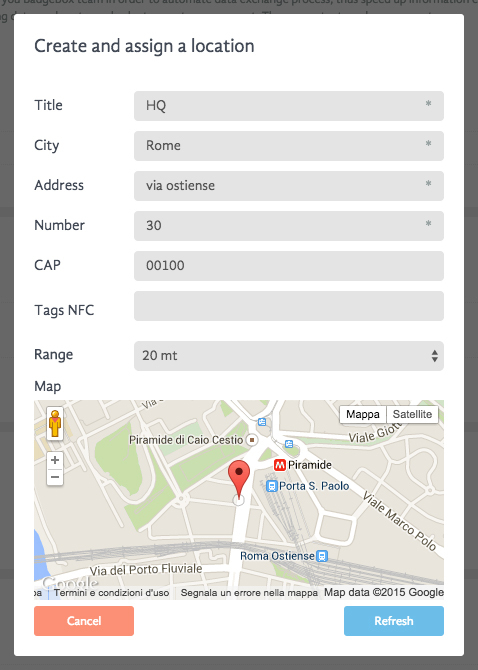 If a company is using clock-in station or NFC tag it is possible to connect a NFC tag to a certain location so that, when an user punches the hour with a certain NFC tag, system recognizes the address.